In a recent blow to U.S. President Barack Obama’s health care reform law, the U.S. Court of Appeals stated that Americans should not be “forced” to buy health care insurance, and that this is unconstitutional. This whole thing you can be sure will go to the U.S. Supreme Court. The fight is far from over, and both sides—those for Obama’s health care plan and those opposed—will fight it out. There is no question that Americans need universal health care coverage, and there is no question that 50 million Americans who lack health care coverage are vulnerable to losing tens of thousands of dollars and all their assets and property if they fall deathly ill or suffer some chronic health ailments. As much as I want to see health care coverage for all, or at least affordable health care, I have serious problems with the Obama health care plan. There are two major flaws with it. First, the law will require people to buy private health care insurance. As we all know, private health care is extremely expensive and this is why we have tens of millions of people who cannot afford it right now. And if people cannot buy it then they will be penalized by the government. If people cannot afford the private health care premiums now then how can they afford the penalties? Oh yes, the government then says that it will provide a “subsidy” for those who need to pay for health care insurance. I do not see this happening. With so many states being totally broke now, there is no way they can pay subsidies for those who cannot afford health care insurance. The second problem with the law is that the Obama administration argues that requiring health care is no different than requiring people who drive to get care insurance or having children get vaccinations to go back to school. There is one major difference between these things and requiring health care insurance. With car insurance it is possible for a person to switch to another car insurance company and get deep discounts. Private health insurance companies are a virtual monopoly and it will do no good to switch from one health care insurance company to another. I know as I have dealt with a number of health care insurance companies. Also, being required to get vaccinations for children will NOT make parents go broke. However poor many parents may be, there is a major difference between spending U.S. $100 or more for vaccinations and being forced to spend thousands of dollars every year for private health care insurance premiums. And there is the rub. This is why the U.S. Court of Appeals has ruled that this is unconstitutional. However well intentioned the law may be, it will force tens of millions of Americans into even greater poverty and destitution. This is simply judicial common sense. 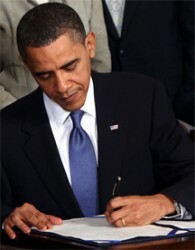 Obama has said that he will have to “tweak” the law so that it will be affordable for all Americans. Right now with how messy this new so-called health care law is it will need more than just some tweaking.